The 11th biennial conference L.M. 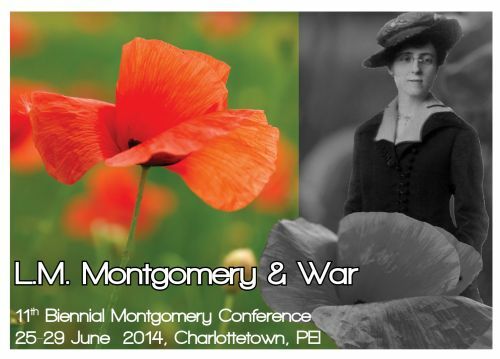 Montgomery and War, took place June 25-29, 2014 at the University of Prince Edward Island. This event explored war, its definition, and its impact through a multidisciplinary examination of L.M. Montgomery’s works and their influence across a century. With an exciting lineup of keynote speakers, including distinguished historian Jonathan Vance, Montgomery scholar and former UPEI President Elizabeth Epperly, and Canada Research Chair Irene Gammel, this conference fostered research excellence and innovative directions in Montgomery scholarship. In connection with our conference, severeal special events were available to both registrants and to members of the general public. Silent Auction in Aid of the Friends of the L.M. Montgomery Institute - Bidding will open on Wednesday, June 25th and both conference participants and members of the public are welcome to bid. The auction catalogue included both Montgomery-related items and ephemera and the First World War. The special exhibition entitled "The Canadian Home Front: L.M. Montgomery’s Reflections on The First World War," curated by Dr. Laura Robinson of the Royal Military College, opened at the Confederation Centre Public Library on Thursday, June 26th. NEW!! "This Anne Place”: Anne of Green Gables as Idea, Book, and Musical at the Confederation Centre of the Arts, guest curated by Dr. Elizabeth Epperly, is a project in connection with the 50th season of Anne of Green Gables - The Musical and available from May 17-Sept. 7. Pop-Up Archives Project - Digitization of war memorabilia, ephemera and collectibles - Wednesday, June 25th at MacDougall Hall and Saturday, June 28th at Confederation Centre Public Library. Conference Banquet & WWI Red Cross Concert - The main social event of the conference, this year's banquet takes its flavour from the time of the First World War with music and entertainment in the style of a WWI Red Cross Concert. Saturday, June 28th.